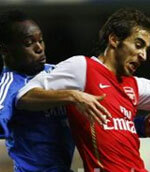 Michael Essien's stunning late goal earned Chelsea a 1-1 draw with Arsenal at Stamford Bridge on Sunday. Mathieu Flamini's goal threatened to end Chelsea's 51-match unbeaten run at home, but The Blues fought back to earn a draw in a thrilling London derby. Chelsea twice hit the woodwork in the closing stages as Arsenal held on to secure a hard-fought point. The result will have pleased Manchester United the most as it leaves them eight points clear of Chelsea in the race for the title. Ashley Cole was roundly booed by the Arsenal fans with his every touch and his first real involvement in the game was when he was bundled over by Alexander Hleb in the opening minutes. Arsenal began in confident fashion spraying the ball across the pitch, but all too often their moves broke down in the final third. It took 15 minutes until any goalkeeper was called into the action when Jens Lehmann comfortably collected Andrei Shevchenko's curling shot from the edge of the box. Michael Ballack had his international team-mate Lehmann scrambling across his goal two minutes later with a fierce shot from fully 30 yards which flashed just wide of the far post. Chelsea almost broke the deadlock on 18 minutes when Arsenal's defence failed to deal with a throw-in towards the box and the ball fell to Lampard who saw his left-foot shot come back off the post and his follow up effort was easily saved by Lehmann. Robin van Persie went close on 22 minutes when he dragged his shot from the edge of the box just wide of the target. A minute later Cole was booked for chopping down Hleb much to the delight of the visiting Arsenal fans. Van Persie looked Arsenal's most dangerous player and he tried his luck from long-range on the half hour but his shot curled straight into the arms of Hilario. Chelsea fashioned another good opening on 34 minutes when Phillipe Senderos blocked Drogba's shot and the ball dropped to Essien who under pressure from Gilberto Silva toe-poked his effort wide of the target. Lehmann had a lucky escape seven minutes before the break when he flapped at Lampard's corner and the ball dropped to Essien who saw his shot kicked off the line by Cesc Fabregas. There was no love lost between both sides and tempers threatened to boil over when Lampard and Emmanuel Eboue squared up to each other just before half-time. Arsenal came out for the second half in a positive manner and Emmanuel Adebayor created an opening for himself two minutes after the restart when he turned Ricardo Carvalho and poked his shot just wide of the target. A minute later Adebayor skipped past John Terry down the right and crossed the ball for van Persie who got above Geremi only to head his effort over the top. Drogba had a half chance for Chelsea on 50 minutes when he got on the end of Lampard's free-kick, but he could not direct his effort on target. Adebayor was causing the Chelsea defence problems with his running and he created an opening for Fabregas on 61 minutes when he burst past a couple of challenges and teed up the Spaniard on the edge of the box but he fired his shot straight down the throat of Hilario. Chelsea had claims for a penalty turned down on 63 minutes when Drogba went down in the box under a challenge from Senderos. Drogba's fall infuriated Lehmann who needlessly pushed Drogba with the striker theatrically falling to the floor and when the Ivorian got back up he barged the German to the ground with both players being booked for their theatrics. Jose Mourinho threw on Arjen Robben and Shaun Wright-Phillips midway through the second half as he went in search of a goal and the speedy pair added more attacking threat to the Chelsea line-up. Robben almost made the breakthrough on 71 minutes when Senderos carelessly gave the ball away to the Dutchman who burst past Eboue and fired in a shot which Lehmann kept out. The ball dropped to Drogba right in front of goal, but Gilberto got back to brilliantly clear the ball from the Ivory Coast ace with Lampard seeing his follow-up shot smothered by Lehmann. Robben was looking dangerous every time he got on the ball and he created a chance for Drogba on 73 minutes, but the striker curled his shot wide of the target. Arsenal broke the deadlock 12 minutes from time when Flamini worked a one-two with Hleb on the edge of the box and he fired in a shot which Hilario got hands on but could not keep out. The goal stung Chelsea into action and Claude Makelele sent Drogba clear on goal on 81 minutes, but with Lehmann bearing down on him the African stabbed his shot wide of the target. A minute later Drogba wasted another great opening when he headed Robben's cross over the crossbar from 12 yards out. Chelsea drew level six minutes from time with a stunning strike from Essien. There looked very little on when Lampard teed up Essien from fully 30 yards out, but the Ghana midfielder thumped his thunderbolt of a shot into the top corner to bring the home crowd to their feet. Arsenal really should have restored their lead a minute later when the ball dropped invitingly to Hleb inside the box, but the midfielder wastefully blazed his left-footed shot wildly over the top. Chelsea should have won it in the closing stages when Essien somehow managed to hit the crossbar from right in front of goal. There was still time for Chelsea to win it in the dying seconds when Lehmann spilled a shot and Lampard latched onto the rebound and fired in a shot which was diverted onto the post by Flamini as Arsenal held on for a point.